The future is always bright in baseball, each year flashing young talent that will play for a long time. This year remains the same. But, looking back at last year's prospects, how will this year follow? We saw Trea Turner breakout into a true top of the order stud, while Andrew Benintendi showed us that his potential is real. Dansby Swanson is expected to get a full-time role this season in Atlanta. Gary Sanchez, Aledmys Diaz, and Willson Contreras were all standout young players too. Jon Gray and Michael Fulmer were standout rookie arms this past year, and I have some interest in Sean Manaea out in Oakland as well. Lets dive into this year's young players on the horizon. We saw a glimpse of Benintendi last season in Boston, showing off his glove, as well as his bat. He saw 118 at-bats this past season, qualifying him to still be a prospect in 2017. He boasted a .357 wOBA and a .181 ISO. Projections, and myself believe those will take a 20 point drop each, which is still above average for a 22-year-old. 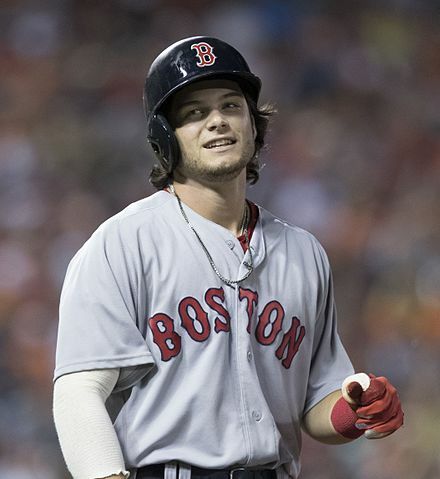 Benintendi will have a chance to reap the reward of hitting in this Boston lineup, and is projected to be the starting left fielder. Former Boston top prospect, Yoan Moncada, was shipped to Chicago in the Chris Sale trade. Moncada will likely start the season in the minor leagues, and come up at some point mid-year. We are looking at about 300 at-bats for Moncada, and some growing pains as well. In standard leagues, you can fire away elsewhere, as there is no real need to stash him right away. Moncada will be a good source of steals late in the year, and the power could be there as well. The hype is high on this one, but big league experience is lacking. Another young shortstop is set to enter full playing time in 2017. Last year it was Corey Seager, this year Dansby Swanson will be leading the way for Atlanta. However, we won't be expecting a Seager like season from Swanson. He should 580-600 at-bats, and if you miss out on the top tier shortstop, I really don't mind grabbing Swanson at his late hundreds ADP. The Pirates have some very young players with exciting futures ahead of them. Austin Meadows will likely see a late season call-up, but is a name to keep an eye on in the future. We will focus on the two names to see a starting role right away. Josh Bell is a contact first baseman, with limited power in comparison to the position. Bell is certainly a good enough hitter to hit around the .275 mark, and his low strikeout rate gives me hope he can do that. If Bell can sneak up into the top half of the order, and others produce around him, RBI and runs could tick upwards. As far as home run numbers go, Bell is likely going to fall around 10-15. In leagues with with corner infield spots, he holds more value, and obviously NL-Only leagues. Tyler Glasnow is the other Pirates prospect I am interested in, but the big concern is the walk rate. The strikeout rate is there, and his future is bright. He is going to start the season in the minors, so here is hoping he can start to limit his walks.